Delight your loved ones with this Classic Colorful Lighting Projection Clock in Style and make them realize how special they mean to you. 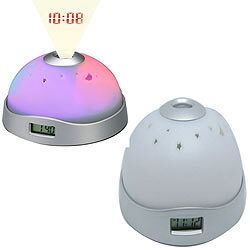 This beautiful Lighting Projection Alarm Clock comes with an dynamic design and 8" LCD screen display. You can also see date and time in this clock.